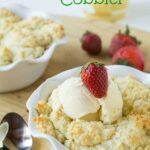 A wonderfully delicious, juicy, and easy Strawberry Cobbler with a light and fluffy biscuit topping. Serve with vanilla ice cream for an out of this world spring or summer dessert. I love a fresh-baked cobbler still warm from the oven topped with vanilla ice cream. I eat it slowly so that the ice cream has time to melt and blend with the cobbler juices. Peach Cobbler always seems to be the most popular cobbler and with good reason. Talk about delicious. You don’t see many Strawberry Cobblers and I don’t know why because strawberries cook up just as well in cobblers as peaches do. We have a strawberry/peach farm right at the entrance to our neighborhood and I’ve been making frequent stops to buy strawberries. I always get the smallest basket they have because they are so extraordinarily ripe they really don’t last longer than a day or two. Plus it is so easy to just stop by and get more. If you can’t use very ripe, in season strawberries I would just use frozen. The average strawberries you buy at the grocery store just won’t have enough juice or flavor to make a really yummy cobbler. 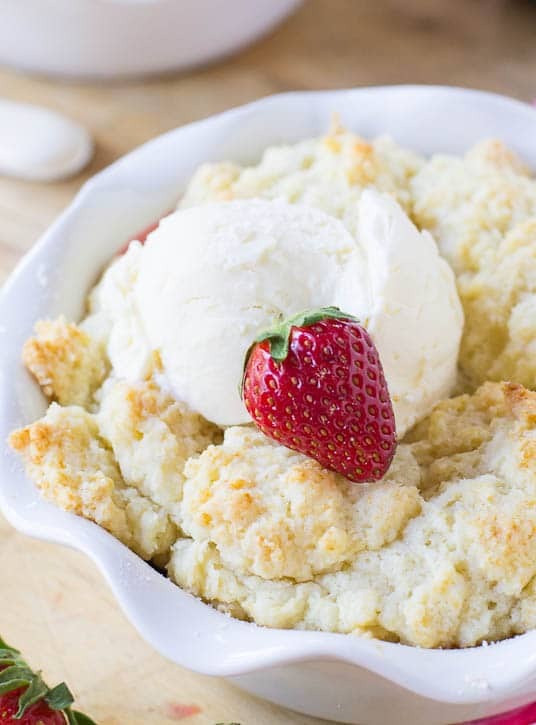 My favorite part of a cobbler is the light and fluffy biscuit topping. If you can, use a southern flour like Martha White or White Lily for an extra tender topping. 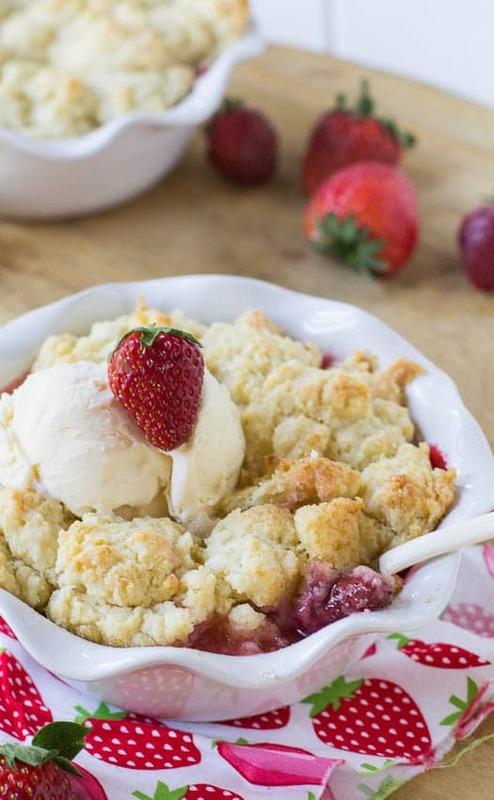 A wonderfully juicy strawberry cobbler with a light and fluffy topping. Serve with ice cream for a spectacular spring dessert. Lightly grease an 8-inch pyrex dish or individual ramekins. Combine ingredients for filling and place in pyrex dish. Add cream and almond extract and mix just to incorporate. Spoon filling on top. It will be clumpy- that’s OK. Sprinkle with sugar to give some shine. Bake until golden brown and biscuit is cooked all the way through, about 30-40 minutes. If making individual servings, check after 20 minutes. Serve with ice cream. This entry was posted in Desserts, Pies and Tarts and tagged cobbler, pies, strawberries. Bookmark the permalink. I made this on Sunday, and it was delicious! I used strawberries, raspberries, and blueberries and baked it in a 8-in square pan. I only had to bake it for around 20-25 minutes and it was perfect. I’m adding this to my recipe book, thanks for sharing! So glad you enjoyed it Kelsey! A combination of raspberries, strawberries, and blueberries sounds fantastic! Oooh, so jealous you have a farm at the entrance to your neighborhood! What a treat to be able to get such nice fruit nearby. I think I’ve made crisps but never a cobbler…but I love the idea of individual ones like these. And who doesn’t like a yummy biscuity topping!!! It is really a treat Amy. The little farm stand is closed for the fall and winter and I count the days until it opens back up in the spring! I’ve had a lot of fruit cobbles but never a strawberry one. Thanks for the inspiration! 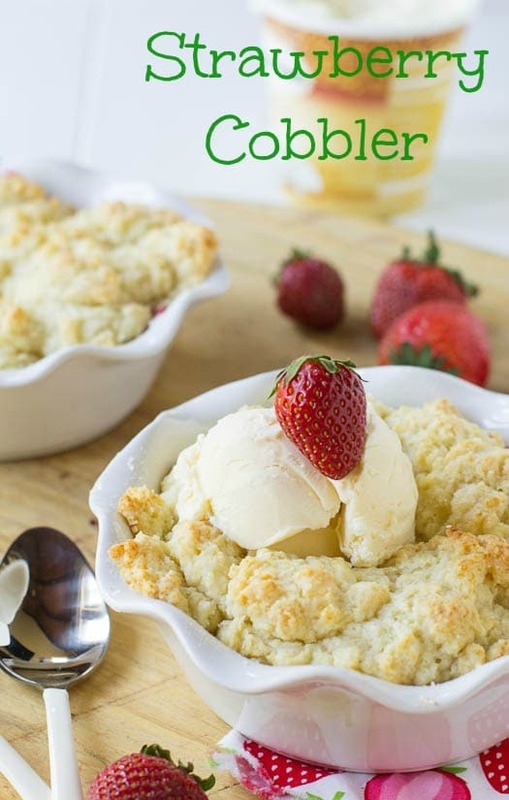 I am allll about cobblers during the summer with some vanilla ice cream! It’s one of my favorite desserts this time of the year! It’s funny because any other time I don’t really want them but warm weather comes around and I can’t get enough! This looks so good! The topping on this cobbler is some serious business! This is one of the best looking cobblers I’ve seen. I have plenty of strawberries, too — pinning! Thank you Marcie! Hope you have a wonderful Mother’s Day weekend! Look at all that topping!!!! That is totally the best part and I 100% agree that you have to let the ice cream melt into the filling…Your strawberry cobbler looks bowl-lickin good! So jealous that you have a strawberry farm right next door…. Your family sure eats well! This looks very pretty and having that strawberry/peach farm so close by is amazing. LOVE this! Best looking cobbler I’ve ever seen – seriously! That topping looks to die for. Pinning! I’m jealous too. I love love love strawberries and peaches!! I just haven’t seen any peaches around here yet. But strawberries I have. And I can’t stop buying them when I see them. Anyway, you’re right, why just peach cobblers? 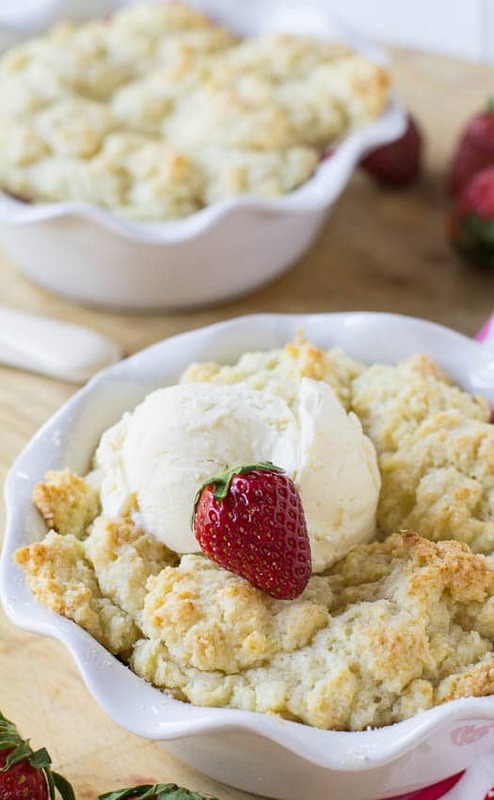 This strawberry cobbler is calling my name! And you just reminded me… I’ve run out of strawberries! Oh no! There is nothing like a freshly baked cobbler…with peak fruit! 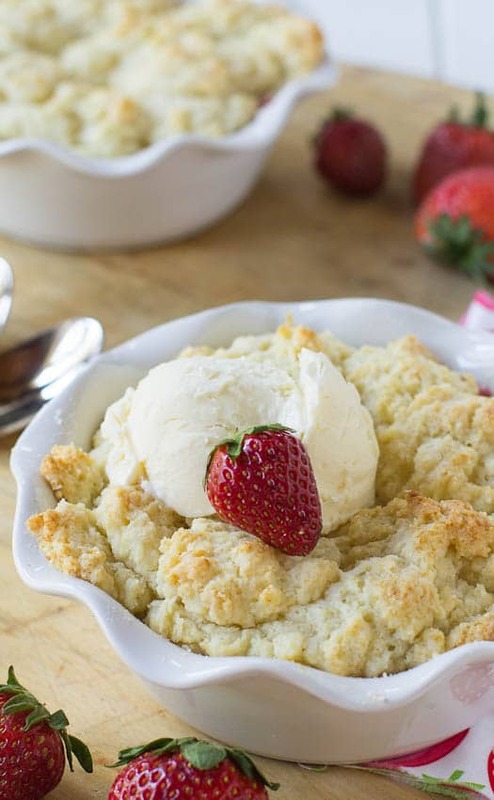 This strawberry cobbler looks perfect. Thank you for sharing it! I’m jealous that you have a strawberry farm so close to you. We have a local one that I picked strawberries at a few weeks ago but the season is pretty much done here. You know I love this cobbler! !